24/7 care for sensitive teeth (1). (1) With twice daily brushing. Sensodyne is the No.1 dentist recommended brand for sensitive teeth. Specially formulated for people with sensitive teeth. Advanced cleaning & lasting freshness. Contains foam boost technology. - Sensodyne is specially formulated to care for sensitive teeth. When enamel is worn away or gums recede, the dentine underneath becomes exposed. This can lead to tooth sensitivity, for example, with hot and cold food and drinks. - Sensitivity is not a one-off problem, it's an ongoing condition that can benefit from using a twice daily specialist toothpaste such as Sensodyne Daily Care. 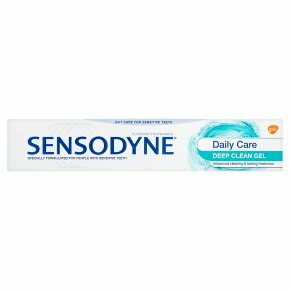 Sensodyne Daily Care toothpastes are specially formulated for people with sensitive teeth, with all the benefits of a regular toothpaste. Use Sensodyne Daily Care whenever you normally brush Contains fluoride to strengthen teeth Brush twice a day to help reduce plaque prevent decay Always Follow the Label Directions Brush twice a day and no more than three times, minimise swallowing and spit out. If irritation occurs, discontinue use. Sensitive teeth may indicate an underlying problem that needs prompt care. If symptoms persist or worsen see your dentist.<br>Keep out of reach of children. Not for use by children under 12 years of age unless on advice of a dental professional or doctor.<br><br>The ends of this carton have been glued down. Do not use if carton ends are open.